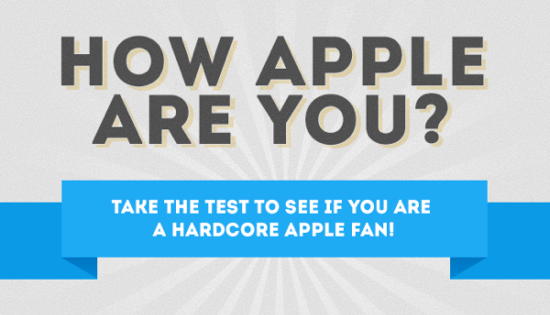 It should be no surprise to anyone (at least anyone paying attention) I’m an Apple fan. I like the company and I like the company’s products. Quite a bit, in fact. I like Apple’s products so much I’ve amassed a fairly large collection of them over the years. I even have one of the first Macintosh computers ever made. I also have an Apple II+ (it was my first Apple product) which came out way before the Mac even existed. In 1979, to be exact. That’s how far back I go. But with all that, how Apple am I really? Fortunately, there’s a handy infographic that can help answer that important question. It can probably help you too. I did pretty well. What’s your score? Note: I like this infographic, which is why I posted it. However, I’ve never used Mackeeper so I can’t endorse it. Do your own research. This entry was posted in Apple, Geek, Personal, Tech and tagged 1984, Apple, Apple II +, iMac, Infographic, iPad, iPhone, iPod, mac, MacBook Air, Steve Jobs. Bookmark the permalink.